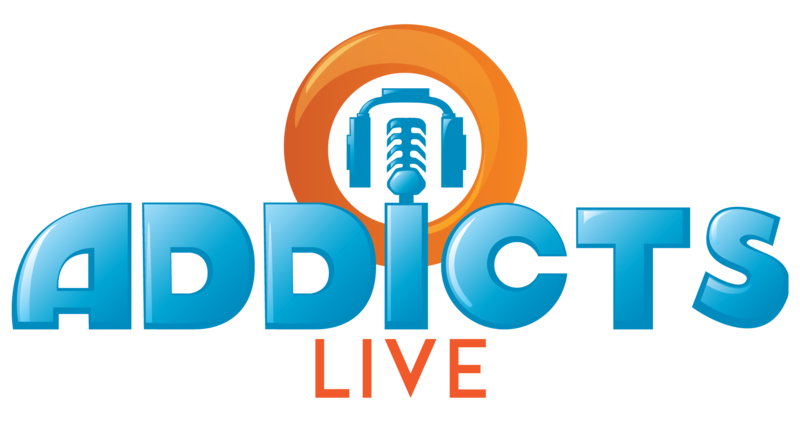 ← Should I Spend Donuts On the Buck Stops Here Returning Content? 2019 is in full swing and we’re in the midst of our first new update of the year! 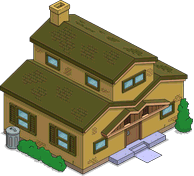 The Not Yet Spring Cleaning mini-event brings a new prize track to Springfield, one full of buildings and a new character! For ease I thought I’d break the prizes down into two posts, one for the buildings and one just for Alice Glick and her animated task. Remember, this event is designed to follow a series of tasks via the questline to unlock prizes. For each of the parts of the Mystery of the Brown House questline, you’ll have to earn via various character tasks in order to unlock the prize for that part. Make Milhouse Investigate Ominous Voice- 4hrs. Squeaky Voice Teen: I hate cleaning for Ms. Glick! She expects perfection. This mop is terrible! Willie: Hey! She may be old and useless, but she’s got a good heart! One magical evening, after too much whisky, she even taught me to dance. Squeaky Voice Teen: Wow, I never knew you and Ms. Glick were a thing. Willie: Me and Ms. Glick? I was talking about the mop! Squeaky Voice Teen: Oh, that’s… less weird? Alice Glick: Wow, you guys did an amazing job cleaning up. Willie: It was a labor of love. Alice Glick: I have one more job: can you guys fix my water heater? Willie: Is that an adjustable pipe wrench with a soft rubber handle? What Does it Do? 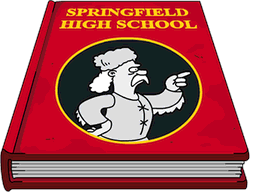 : Building for Springfield, earns cash and XP. Has a permanent (4hr) task for Marge, take a Night Class. Marge: With the kids playing after-school hockey, and Homer drinking after-work hooch, I don’t know what to do with my nights. Apu: You could borrow my bulletproof vest and work the graveyard shift at the Kwik-E-Mart. Fat Tony: You could launder some… “clothes” for me. The clothes are filled with illegally obtained money. Marge: I didn’t know so many Springfielders were interested in furthering their education. Helen Lovejoy: I’m just here because I wasn’t getting enough gossip at church. Gil: I come for the indoor heating. Otto: I’m here because the textbook pages make great rolling papers. Marge: Ah, home sweet home. What will I do first. Marge: Oh, right. Take care of my infant child. What Does it Do? 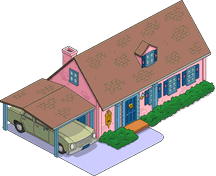 : Building for Springfield, earns cash and XP. Permanent tasks for Lisa, Alice, and Lewis. Animated when in use. Nelson: Man, my fastball is on fire today. I’ve thrown rocks through six of the Brown House’s windows! Lisa: Stop it, Nelson! How would you like it if I threw stuff at you? Nelson: I’d like it a lot. It’d mean someone was paying attention to me. Lisa: Aw, Nelson. Come on, I’ll help you fix the windows. Master Brown House: No. *sniffs* Don’t worry about me. Just work on fixing yourself, little boy. Nelson: Heh-heh, my crippling loneliness pays off again! Lisa: What’s the matter, Mr. Brown House? You seem down. Master Brown House:My floor boards are really creaking today. I think I may be… haunted. Lisa: There’s no such thing as ghosts. Lisa: I’m sure there’s a logical explanation. But just in case, I have a how-to book on performing exorcisms. It’s called “The Power of Advice Compels You”. Master Brown House: The exorcism worked! The ghost is gone! Lisa: It wasn’t a ghost, it was Nelson squatting in your house. And that’s it my friends, the details on the buildings from the Not Yet Spring Cleaning prize track! For now, what are your thoughts on the buildings? Where have you placed them in your town? Sound off below, you know we love hearing from you! This entry was posted in Buildings, Decorations, Mystery of the Brown House, Not Yet Spring Cleaning and tagged brown house with legs, How do i get Alice Glick's House, how do i get springfield university, how do i get the original brown house, Tapped Out Tips and Tricks, Task at Alice Glick's house, task at springfield university, task at the original brown house, The Simpsons Tapped Out, TSTO Addicts, TSTO Tips and Tricks, weird looking brown house, What does Alice Glicks House do, what does springfield university do, what does the original brown house do. Bookmark the permalink. 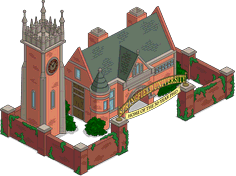 At first, I thought that none of the prize buildings would have any tasks with them but I was surprised that they all have tasks with them though Springfield University is a bit underused since it only has a task for Marge. I like that EA gave Alice Glick some tasks at her house and one at the Original Brown House. I’m planning on placing Ms. Glick’s House and the Original Brown House in my residential area which I finished just before the Christmas event started. I’m thinking of placing Springfield U with the prep school since they have a similar design to each other and adding some Maple and Willow trees with them both. Am I crazy but shouldn’t this mini event have been saved for a precursor to Halloween? Haunted house that devours kids souls to keep nana alive forever? I keep getting 99 totals before I get the next prize meaning I only need 1 more candy. 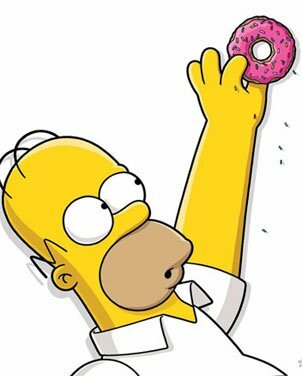 I have to wait 4 hours for that one or use 2 donuts… I’m slow too. Only at the second prize. I didn’t get the fifth prize even if I completed everything. Anyone else had the same problem? The fifth prize is not an item but it unlocks a visual 8 hour task for Alice Glick “Have a Knitting Circle”. You should have a questline for Alice Glick start after you got the fifth prize and you should’ve seen a screen pop up similar to the one that appeared at the start of the main event’s questline. Finished the event this afternoon, along with lvls 57-59. Finished lvl 60 months ago because it popped up somewhere around lvl 20. I have finished all the levels now, thanks to the Addicts level guides (in times when levels would get stuck midway through). Woohoo! LOVE this event! I’ve finished it already but absolutely A1 in my opinion. Love the buildings and the Golden Goose 😍 Thank you EA. Totally awesome. Did anyone get their Xmas tree farm back?? I loved this event! The prizes were great and so was the story! Now to “patiently” KEM farm until next Wednesday.